A recent ASIC Report that identified an “Unacceptable level of failure” by the life insurance industry was caused by conscious or unconscious systemic structures that drove the behaviour of the Financial Advisers. Systems Thinking teaches us that organisational structures (rules, policies, procedures and physical structures such as office layouts) influence the behaviour of the humans who operate in that system. The concept is known as Structures Drive Behaviour. The ASIC Report found that the system provides upfront commissions for Financial Advisers in 82% of cases. The commissions could amount to around 100% of the annual premium and are therefore very lucrative. Unfortunately ASIC has discovered that 96% of the poor advice provided by Financial Advisers was when the adviser was being paid an upfront commission. There appears to be a direct link between the structure of upfront commissions and the provision of poor advice. Leaders have a responsibility for understanding the behaviours that their structures will drive. I am not saying the leaders in the life insurance industry here in Australia understood the consequences of the structures they put in place because I don’t know. However, as part of the characteristic of foresight, a leader should consider the intended and unintended consequences of the rules, policies and procedures that they put in place. If you work in a sales environment and you want your sales team members to share information with each other, a commission structures that is 100% based on individual performance is unlikely to drive the sort of information sharing behaviour that you desire. Instead you need to create a system (with input from your sales team members) that provides commissions for both individual and team based behaviours and performance. Creating a service counter that is only wide enough for one person will create queues. In turn these can block thoroughfares. If you don’t want these consequences then you have to consider how you can physically design and staff your service counter to minimise queues, or you need to design a queuing system that will reduce the clogging of your thoroughfare. A common error that leaders make is when their team members behave or perform in ways that the leader doesn’t like, the leader blames their people. Systems Thinking teaches a different perspective. First review the structures that might be causing the behaviours and/or performance results that you don’t like. You can identify when a systemic structure is operating when you have different people come in and out of a system but the behaviours and/or performance outcomes remain the same. Often (but not always) changes to your rules, policies, procedures and/or physical structures will change the behaviours and poor performance results that you are seeing. Of course, humans are humans and it is possible to have the best possible structures in place and humans can choose to ignore them and do their own thing. But this is a rarity compared to a norm. If you are experiencing poor behaviour and/or performance results from your team, consider assessing the systemic structures that may be influencing these outcomes before blaming your people. After all, who wants to end up being named in a government report for leading an industry that generates poor outcomes for its customers? 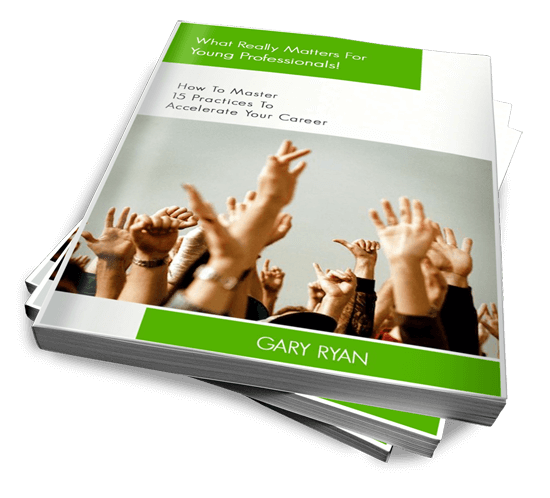 Gary Ryan enables talented professionals to Move Beyond Being Good. Dee Hock, Founder and CEO Emeritus of VISA International which is arguably the most profitable business in the world, believed strongly in Servant Leadership. He believed that Servant Leaders manage their time very differently to the hierarchical, top down style of leaders that he abhorred. So how did Dee Hock believe that a Servant Leader should spend their time? Fifty percent of your time should be spent managing yourself. This is how you manage your own continuous development, how you challenge your own thinking, how you manage your response to someone who says something that you disagree with, how you manage yourself when things go wrong and so on. Managing yourself is an activity that co-exists with everything else that you do with your time which is why the percentage is so high. Twenty five percent of your time should be spent managing those who have formal authority over you. This is the classic ‘managing up’. You do this by challenging them, influencing them, providing them with data, respectfully questioning them, articulating possible futures grounded in purpose and values, being true to the organisation’s vision, mission and values among other methods. Twenty percent of your time should be spent managing those over whom you have no authority, and they have no authority over you. These are your peers and colleagues. You manage these people in a similar way to how you manage up. Once again you do this by challenging them, influencing them, providing them with data, respectfully questioning them, articulating possible futures grounded in purpose and values, being true to the organisation’s vision, mission and values among other methods. How much time is left for managing those over whom you have formal authority? Five percent. Yes, that is correct. Five percent of your time. “How could you be an effective leader and only spend five percent of your time managing those people who directly report to you?” I hear you ask. As Dee Hock says all you have to do is teach them the same model for how they should manage their time. That way they will be spending 25 percent of their time managing you. When they come to you with issues you will then know why they are coming and give them your undivided attention. When I teach people these principles they are often stunned at these percentages. “They don’t seem right. I’m accountable for my team. I just can’t see how this could work!” are the rebukes I receive. It is true that this is a different way of thinking and seeing the world and your role as a leader. But if it can work for the man who created the most profitable business in the world, then why can’t it work for you? Over time I have found some interesting trends when working with children. When I have asked them to raise their hands if they believe that they are a leader or could be one in the future, virtually all the children raise their hand. When I then ask them, “Who are leaders?” they unanimously respond, “We are!”. For children, the concept that everyone is a leader and they have to lead themselves seems relatively natural, yet for adults it seems (for many) quite foreign. When we facilitate leadership education for adults one of our key themes is that you can’t lead others if you can’t lead yourself. My experience has taught me that children understand this idea, so we adults have a responsibility to continue to help them understand this concept by re-enforcing that they are, in fact leaders. To do this, find them making positive choices and recognise them for it. The importance of choices is explained in the second lesson below. None of us are perfect. We will all make poor choices. 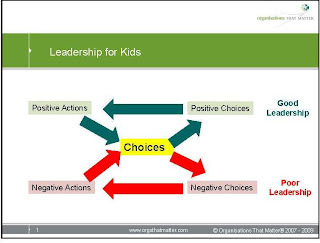 Overall leadership is dependent upon the balance of our choices. Are they generally on the good half of the model, or the poor half? 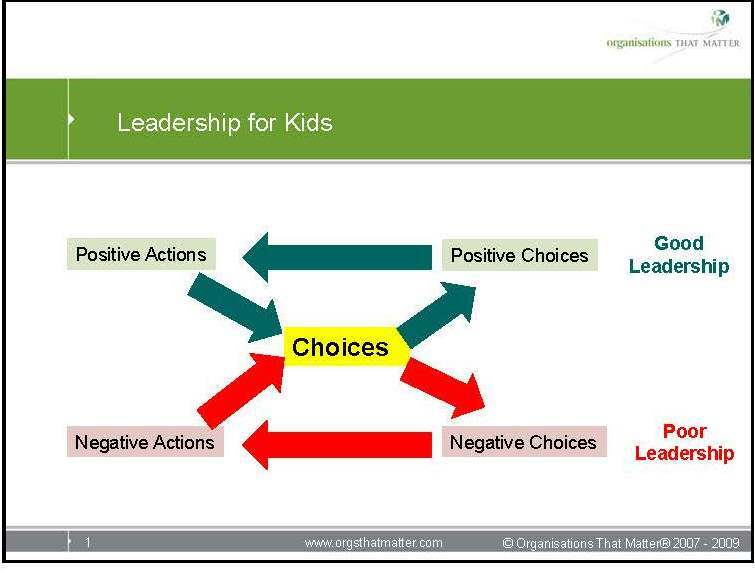 Over time we can consciously develop positive habits to enhance our good leadership through making good choices. Maybe this leadership stuff isn’t so hard after all, which leads to the third and final concept. Over the past few weeks I have conducted a number of teamwork programs. One of the activities that I enjoy facilitating is asking the participants to form small groups and to identify the characteristics of the effective and ineffective teams of which they have been members. After providing the participants with enough time to share their stories, I collect the results. An interesting characteristic that always comes up for effective teams is trust. Similarly, a lack of trust is always raised as a characteristic of ineffective teams. Trust. Easy to say. Hard to give. You can’t fake trust. It is either genuine, or it isn’t. In today’s complex world it is nearly impossible to ‘go it alone’. Leaders have to trust their team members to do their job, even if the leader could do parts of the job ‘better’ on their own. To trust, however, requires the leader to be okay with being vulnerable. Trust can’t be broken if it isn’t given. So, by nature genuinely trusting someone means that you are prepared for the possibility that they might break your trust, which in turn makes you vulnerable. In our world of accountability and responsibility, trust can become very hard to ‘give’. If I’m the leader, the ‘buck stops with me.’ If this project fails, then it’s my fault. It’s complex, isn’t it. I doubt there is any golden rule with regard to trust. I am a trusting person, but I am not prepared to trust ‘just anyone’. I use all my ‘three brains’ (I’ll explain what that term means in a future blog) to determine whether I will trust someone or not. Each time I trust someone I am conscious of the choice that I have just made. Trust is behavioural, so saying, “I trust you” means nothing, if (in a work example) all I do is look over your shoulder every step of the way. Being prepared to be vulnerable is a tension leaders have to grapple with. Are you prepared top be vulnerable? What are your experiences of trust both as a team member and as a leader? How have you managed the ‘vulnerability’ tension? The chances are that if trust is not present then high performance will be a long way away. So what is the bigger risk, the preparedness to be vulnerable or the preparedness to under-perform? Please share your experiences, thoughts and comments. I was amazed at the number of times there were groups of people who were collectively blocking the various thoroughfares as we were trying to make our way through the airport. Each time we ‘excused’ ourselves to make our way through these groups of people it struck me that each individual seemed to be unaware of the impact that the group of which they were a member was causing the people around them. ‘Awareness’ is a Servant Leadership characteristic and includes a consciousness of 360 degrees around us, much like a martial artist is aware of the full circle around them. What is your level of awareness, both individually and when you are part of a group? Is awareness a leadership characteristic that you have ever considered? What experiences of ‘awareness’ have you had that you are comfortable sharing with others? Webinar recording. Gary Ryan explains the ten characteristics of Servant Leaders. Gary also explains how a Servant Leader spends their time when in a managerial role.